Welcome to Image Clothing Inc. website. Please take your time to review these Terms and Conditions. - Signing up for our email newsletters automatically enters you into our contest. - Persons already subscribed to newsletters are automatically eligible to win. - Contest ends 08/15/2014. Three winners will be chosen by random drawing. - Contest winners will be contacted via email by 08/15/2014. - If ShopAtImage does not receive a reply within a week, contestant shall forfeit their prize. - Winners shall each receive a $100 gift certificate to ShopAtImage. Simply enter your email address at the bottom of our site or in the pop up page that shows up when first entering site. If you wish to physically enter our contest, submit your email at any cashier register at any of our physical stores. Gift cards purchased on Shopatimage.com are valid for online orders only and are not valid in Image stores. Gift cards purchased at Image stores are valid for in-store purchases only and are not valid for Shopatimage.com online orders. Any user submitted contents such as comments, feedback, and suggestions submitted or disclosed to Image shall be and remain as property of Image By submitting any user-generated content, user hereby grants Image perpetual, irrevocable, transferable right and license to use such content without compensation to the user. All content submitted by user may be used at the sole discretion of Image without any obligation of confidentiality.User agrees that any comments or materials submitted to this Site are not intended for commercial use and are for personal use only. We reserve the right to limit the order quantity on any product to customers and to refuse service to any customers that violate the terms of our Website. All prices displayed on this website are quoted in U.S. dollars. The products displayed in our Site are available online and at select Image stores in the United States. Some of our featured items may be available in limited quantity. If you have any questions concerning the availability of a specific product, please contact our Customer Service. If you are dissatisfied with any Image product, please Review the details of our Return & Exchange Policy. You agree that you are only authorized to use Image Website for your own personal use, and that you shall not duplicate, download, publish, modify, or otherwise distribute the material on the Website for any commercial use, or for any purpose other than as described in this Agreement. ShopatImage.com does not make any warranties or representations regarding the use of the materials in this Site in terms of their correctness, accuracy, adequacy, usefulness, timeliness, reliability, or otherwise. Promotion codes cannot be applied to items already on sale. Image will do its best to ensure that any content (text, images, photographs, logos, illustrations, descriptions, data and any other materials) on this site are accurate and complete. We reserve the right to correct, update, alter, or terminate any information without prior notice. In the event that a product is listed at an incorrect price, specification, quantity, or description, Image reserves the right to modify or update information at any time without prior notice. If an item has been mistakenly listed at an incorrect price, Image reserves the right to refuse or cancel any orders placed for incorrectly listed product. 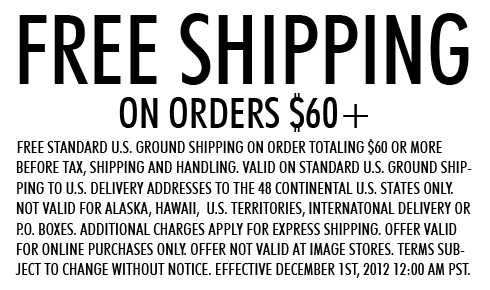 Free Shipping Over $50: Receive free UPS ground shipping for online purchases of$50 and up before tax. Offer is valid only to residents of the continental U.S.excluding Alaska and Hawaii. Image has the right to terminate this offer without notice.